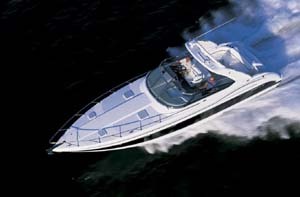 Campion Allante LX 825i Mid Cabin: Sharp model takes cues from an existing winner. When creating the 825i, designer Neil Gilbert and the Campion R&D team took inspiration from last year's Allante 805 and shaped it to fit the needs of the Campion customer. Campion has been celebrating its 30th anniversary throughout the last year, but prospective boat buyers are just now receiving their anniversary present — in the form of the new Allante LX 825i Mid-Cabin. Campion has given the 825i the best characteristics of the 805, its predecessor, and it has imbued the boat with new design and styling features that make it an even more functional cruiser. The 825i is brand-new for 2004, but it might strike you as slightly familiar. It has that tried-and-true Campion look to it, thanks in large part to the fact that it shares its styling with the company's LX 925 and LS 645 models. When creating the 825i, designer Neil Gilbert and the Campion R&D team took inspiration from last year's Allante 805 and shaped it to fit the needs of the Campion customer. It appears that the team has taken an "if it ain't broke..." approach to much of the boat, but at the same time, they weren't afraid to make some logical changes to the way space is used in the cockpit and cabin areas. For instance, the 805's walkaround has been replaced by a walk-through windshield that makes it much easier to get to the forward deck. This tall windshield also provides ample protection from the wind and elements — and it makes for excellent visibility. Campion has intentionally made the boat very wide for its size. Its 9-foot, 4-inch beam makes the 825i feel larger both in the cockpit and in the cabin — which it is. The boat also stands very tall on the water due to its vertical thickness, which makes for more headroom in the cabin and greater visibility at the helm. We were back up north again, in Kelowna, British Columbia, for this most recent test. 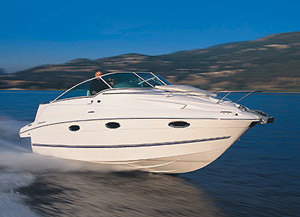 Our previous test of last year's Allante LS 645, which ran in the April 2003 issue, also took place on Lake Okanagan. We were happy to be back. The area was experiencing one of the worst fires in its history. The fire had devastated much of the beautiful countryside and covered the lake with a canopy of smoke. Our test boat was a prototype that was almost completely finished, except for part of the interior. To give an indication of the final product, Campion had installed a tank with approximately 1,000 pounds of water ballast to simulate the interior. 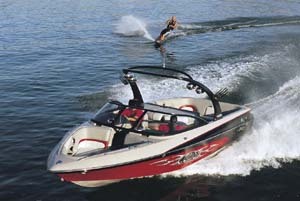 A single Volvo Penta 5.7 GXi powered our test boat. 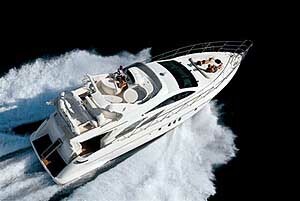 The formidable 320 hp engine delivers plenty of torque and power across the entire speed range. For instance, we were able to hit plane in 7 seconds, and the boat went from 0 to 30 mph in 15 seconds. 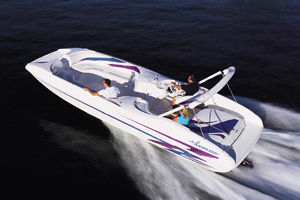 With the 5.7 GXi powering it, the boat hit plane at around 2,800 rpm. The 5.7 GXi's Aquamatic single-propeller drive can be run with both right- and left-hand props, and it uses a Multi Port Fuel Injection system. The engine comes equipped with artificial zinc anodes on both the drive and the transom shield. A comfortable cruising speed for us was approximately 33 mph, at 3,400 rpm. We liked the big-boat feel of the Allante 825i, especially with its wide beam that gives it plenty of stability, allowing it to settle down onto plane very effortlessly. Even at a top speed of 47.1 mph, the ride was comfortable. Our tour of the Allante 825i started with the foredeck. We like the fact that Campion made a large, removable sunpad cushion available as an option up forward, making the most use of the space. Sunbathers will love it. Up in the cockpit, the layout is simple, with a long settee wrapping its way around most of the interior — if you use the filler cushions, which allow you to change things around to suit your needs. When the filler cushions are in place, the settee starts just outside the entrance to the cabin and winds all the way around to the back side of the captain's seat on the starboard side. There is a break in the center, at its aft-most point, allowing for easy access from the rear swim step. If the filler cushions are removed, you are left with small settees on each side, and a wide-open deck at the back. Personally, we preferred it with the filler cushions (which are standard, by the way) in place. With the removable pedestal table serving the settee, it's a great place for conversing and dining. A wet bar is built into the front part of the settee, to port, so it's the first thing you see when exiting from the cabin. The cockpit also has courtesy lighting and smart-looking snap-in carpet. The helm is equipped with tilt steering, an AC outlet, a compass, an in-dash depth sounder, an hourmeter and other instrumentation, as well as a Clarion weatherproof AM/FM stereo with a CD player, six speakers and a cabin remote. 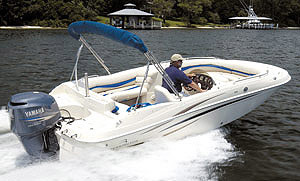 Other noteworthy features include a set of trim tabs with indicators, engine room lights, twin bilge pumps with auto float switches, a remote oil filter, an in-dash glove compartment, a 36-quart portable cooler (hidden under one of the settees), a double helm seat with flip-up bolster, a fiberglass cabin liner, and even a shower system with hot water. The comprehensive canvas package includes not only an acrylic Bimini top but also front and side curtains, a camper back, and boots. 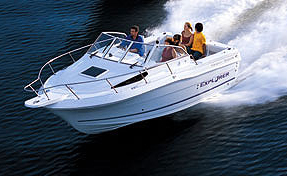 A radar arch is available as an option, as are freshwater cooling, a cockpit icemaker, GPS chartplotter, VHF radio, transom stereo remote, cockpit refrigerator, 2000-watt inverter with charger, television antenna, DVD player with LCD monitor, forward sunpad and remote spotlight. Although the cabin was not quite complete for our tour, when you enter the cabin, you step down into it from the port side, so the 825i's galley, which is located against the port wall, is right in front of you. An enclosed head compartment is directly across from it to starboard. A V-berth is at the bow, and a mid-cabin berth is behind you, to starboard, tucked underneath the cockpit deck. The cabin has plenty of light, thanks to the three portlights built into the foredeck above. The galley comes with a 12v refrigerator, a 110v/alcohol stove and a microwave oven. The enclosed head includes a vanity and a sink. The electric head has a macerator and a holding tank. The V-berth is actually a convertible dinette that is served by a pedestal table. 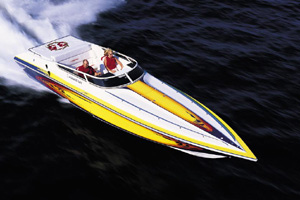 Campion excels at creating sophisticated boats that have a clean, fresh look. They feel very American in some ways, yet there's a hint of a European quality to them, which makes sense considering the company's Canadian origins. All of the standard and optional features on the Allante 825i allow you to have it as "tricked out" as you want, and that's an anniversary gift that buyers will relish. Bore and stroke 4.0" x 3.48"
Cockpit wet bar, courtesy lighting, snap-in carpet, tilt steering, AC outlet, compass, in-dash depth sounder, hourmeter, Clarion weatherproof AM/FM stereo (w/CD player, six speakers and cabin remote), trim tabs w/indicators, engine room lights, twin bilge pumps w/auto float switches, remote oil filter, in-dash glove compartment, 36-quart portable cooler, double helm seat with flip-up bolster, fiberglass cabin liner, hot water and shower system, Bimini top, front and side curtains, camper back and boots. Anchoring package ($2,800), color-coordinated gelcoat feature ($1,293), stainless steel radar arch ($2,950), remote spotlight ($467), GPS chart plotter ($1,008), VHF radio ($694), cockpit icemaker ($1,702), cockpit refrigerator ($1,045), hot water cabin heater ($814), genset ($11,702), 2000-watt inverter w/charger ($3,387); television antenna ($308); DVD player w/LCD monitor ($2,369), CD stacker ($436), forward sunpad ($304).